Even America’s protected areas are being subjected to harmful levels of noise pollution. If a tree falls in the forest, and there’s no one around, the National Park Service will still hear it. For the past decade, staff at the NPS have been lugging recording equipment into almost 500 sites around the U.S., in a bid to measure the sounds of the nation’s quietest places. For weeks at a time, sensors measured local noise levels, microphones recorded the actual soundscapes, and weather instruments noted temperature, air pressure, and other factors that affect the travel of sound. Collectively, the NPS recorded almost 1.5 million hours of sound—an extensive archive of bird songs and wolf howls, butting bighorns and tail-slapping beavers, rumbling thunder and rustling foliage. Rachel Buxton from Colorado State University and her colleagues have now used their bonanza of data to map the extent to which excessive noise permeates American wilderness. The data revealed that a surprising swathe of protected areas are being carpeted by the clamor of human activity. People have doubled the background noise levels in two-thirds of these supposedly pristine zones, and increased noise by 10 times or more in a fifth of them. “If you could have heard something 100 feet away, now you can only hear it 10 feet away,” Buxton says of the latter. That’s a problem. Over the past two decades, many studies have shown that human-made noise can cause stress, disrupt feeding, drown out mating calls, mask the approach of predators, and suppress the complexity of animal songs. It even affects species without ears: Some plants suffer as seed-dispersing animals are driven away. And in perhaps the most clean-cut demonstration of the harms of noise, one team of scientists set up a “phantom road” in Idaho—recreating the sound of passing traffic through speakers lashed to trees. That half-mile corridor of disembodied sound drove away a third of the local birds, and suppressed the weight of many of the species that stayed. In fairness, the NPS has long cared about sound*. The Organic Act of 1916, which created the agency, charged it to “conserve the scenery and the national and historic objects and the wild life therein”, which subsequent policies took to include “natural soundscapes.” A few later acts, all meant to address the problem of noisy aircraft flying overhead pristine quiet, led to the creation of the agency’s Natural Sounds and Night Skies Division—the group responsible for the hard-won recordings that Buxton used. Working with NPS engineers, her team used the assembled data to predict sound levels all over the U.S., taking account of factors like roads, aircraft routes, climate differences, tree cover, nearby rivers, and more. They also predicted what those levels would be like if humans weren’t around, to pinpoint the regions where our influence contributes to the greatest ruckus. The team found that protected spaces are indeed quieter than unprotected ones, but many are still unacceptably noisy, including regions that are havens for endangered species. Around 58 percent of the areas had sound levels that were twice the natural baselines, and 14 percent had levels that were ten times higher. Even wilderness areas—remote and heavily protected regions that, by definition, are “untrammelled by man”—aren’t immune. Most of these were expectedly tranquil, but around 12 percent had sound levels that were twice the natural baselines. “The biggest culprits by far were aircraft and vehicle noise,” says Buxton. Industrial land use was also a problem, including mining, forestry, and oil and gas extraction. And some sites, like Rock Creek Park and the National Mall in Washington, D.C. were inundated by the clamor of crowds. “We actually have some really promising technologies for reducing noise,” says Buxton. There are quiet pavements whose porous structure better absorbs the noise from passing engines and tires, and sound-absorbing barriers that can help to reduce the cacophony of drilling rigs. Even when noise is inevitable, it can at least be corralled. “We can’t do away with flights altogether, but you could move a flight path over an already busy road rather than over a nice swathe of quiet area,” Buxton notes. Even simple measures can make a noticeable difference, says Emma Lynch from the NPS. 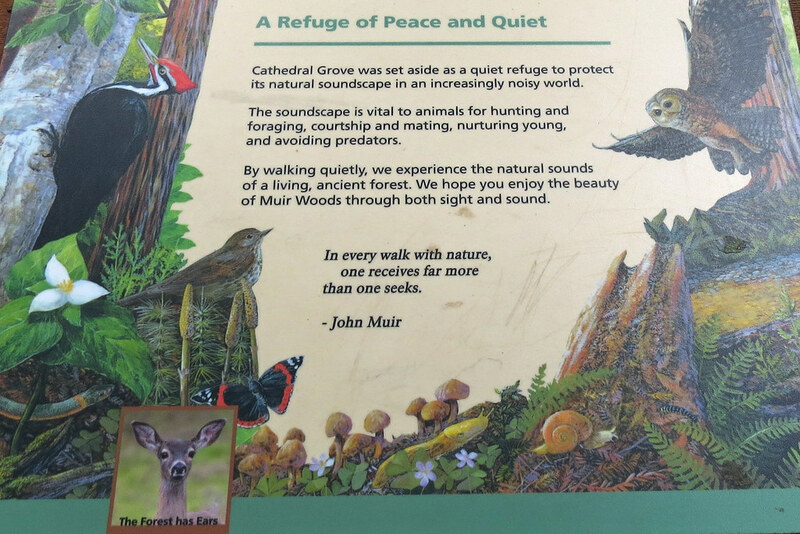 The staff at Muir Woods National Monument recently did an experiment where, on a random schedule, they stuck up a sign that declared part of the park as a quiet zone, and encouraged people to talk quietly and silence their phones. When the sign was up, the sound level in that zone fell by three decibels—a halving of sound energy, or the equivalent of losing 1,200 visitors but with no actual drop in footfalls. The signs are now permanent. In a similar way, Buxton’s map “gives managers of protected areas a way to see where mitigation can be applied to see immediate results,” says Lynch. * This article originally misstated that the Organic Act specifically mentioned soundscapes, when such provisions were only added to NPS policy later. We regret the error.